Except for the advanced revolutionary tactic developed for the use of the battle tanks, the Nazi were not the incredible innovators of armoured vehicles that maybe the winning propaganda – and a certain levity in reconstructing the events, has been handed down to us. In the years immediately preceding the outbreak of the World War II, the armoured fighting vehicles (AFV) at Hitler’s disposition were light and bad armed and only an extremely poor amount of vehicles, considered as “middle” for their weight and equipment, had an operating place during the combat in Poland and France. The triumphs of the first two years of the war were expected to even more revolutionary factors than the features of the employed AFVs. Shortly, the main factors were: the creation of armored formations that were independent of the infantry division, the combination and the collaboration among different equipments, the tactical air support – for example during the attack of enemy strongholds – dynamic commands, blitz and accurate strategic planning. Enemy’s errors were exploited without any hesitation. When the War extended to the east, against URSS, the turning point of the administrative directives happened, about the prototypes and the projects of the new tanks to be approved. The meeting-clash with the Soviet T-34 [picture 1] turn out to be shocking for the German High Command. The T-34 can be considered the best (relative, not absolute) armoured tank of World War II, contextually to the historical period and to the operating requirements to which it was called to react. The Panzer IV “Tiger”- the first heavy (57 tons) tank of the German army – revealed to be hardly manoeuvred and with an outdated, even if excellent, armoured design, because it was not sloped in order to deflect enemy’s strokes. In response to the Panzer IV the Germans produced the the Sd.Kfz 171, also known as Panzer V “Panther” [picture 2], intended to conceptually revolutionize the future of the armoured tanks, but even too delicate and futuristic to seriously drive the fate of a by now lost war (it went in service on July 1943). On one side the Russians combined the production of standard tanks – the T-34 in its many variations – with the production of heavy tanks like the JS-1, giving the priority to the medium tank; on the other side the Germans – in a serious spot in supplying the raw materials that divert the research and the study of new prototypes to the way that the rest of the world would consider the right one – that of the middle tank – and focus on the development of heavy and ultra-heavy tanks. Mainly defensive options are outlined in the very top of the chain of command. The sacrifice of the mobility – in favour of the solidity of the tanks – seemed to be a blind but clear mantra in the choice of the prototypes, in the development of new versions of old tanks (the King Tiger, for example, was the 70t version of the Panzer VI “Tiger”). An almost controversial choice that significantly contributed to the final fate of the war. One of the most interesting project to be studied is surely the Maus. The serial name Panzer VIII felt into disuse and it has been later attributed to him by the allied. Germans knew it as Sdk.Fz 205 “Maus” (Mouse) [picture 3], – 175t weight – would outclass every other fighting vehicle at that time existing thanks to his weaponry and armouring. The Krupp company would deal with the construction of the components, Alkett of the assemblage. The first prototype, named V1, was tested, without the turret, in 1943. In the following months, after many months studying, the upper part has made ready, equipped with a 150mm gun. At the beginning, an 128mm KwK44 had arranged, the same of the Jasgtiger (the self-propelled version of the Tiger) but it was agreed that – whether the features of the tank resulted as functional, a bigger calibre would be applied. According to Adolf Hitler thought, an inferior calibre would be a waste and a scorn compare to the power of the ultra tank. The armour was 220 mm thick frontally, 190mm in the sides and in the rear, 240mm front and 220mm rear in the turret. The first model was classified as “V1”. The tests showed the limits of the idea: the suspensions underwent an awful strain and there was no way to make them sufficiently solid, the maximum speed, with optimal ground conditions was 13km/h and the huge weight made impossible to cross bridges and soft lands. Despite this a second prototype was built, improved in the width of the tracks -that reached the 1200mm- and equipped with the well-tested 128mm gun, together with a 75mm co-axial gun. A machine-gun was also added, for the close-range conflict with the infantry and as anti-aircraft weapon. In July 1944 the estimated orders of 5 tanks in a month were cancelled, given the technical impossibility in respecting the “mass” production. 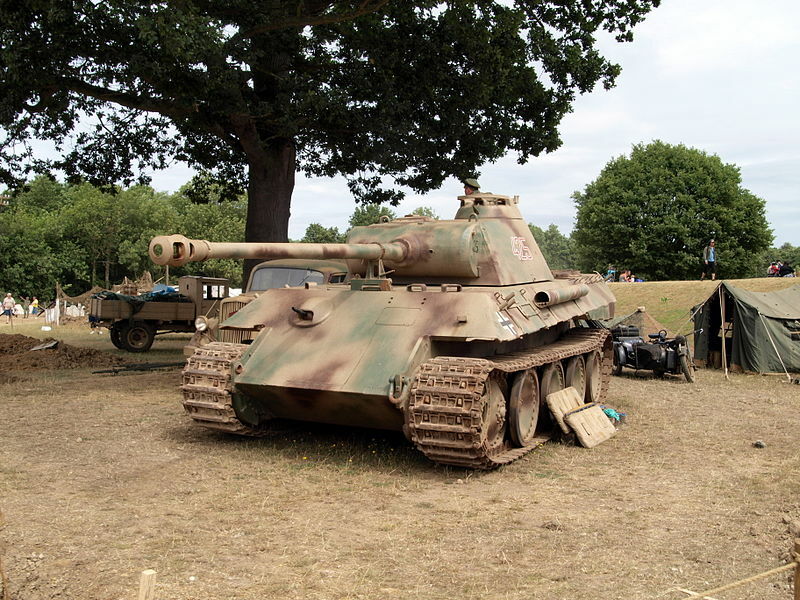 The two prototypes went on with the tests and in the Kummersdorf industrial complex is reported the use in battle of the Maus, where – from non accredited Sovietic’s mouth, many Russian armed tanks were entirely destroyed, so that the aviation action was needed to knockout the gigantic Panzer. VI’s turret was then built by Russian engineers after the end of war, with the V2’s chassis and the tank is still exposed at the Kubinka war museum [picture 4]. Originally published in italian 11th Sept, 2012. English Translation by Eleonora Spartà.
. London: Arms & Armour Press, 1999. Stampa. © Giovanni Melappioni, courtesy of Talento nella Storia: independent, apolitical website about history. Published in Italian 11th Sep, 2012. Marchigiano, classe 1980. Ristoratore di professione, scrittore per passione. Vincitore della "Giara d'Argento" RAI 2014 con il romanzo Missione d'onore. Terzo classificato al concorso "Parole Resistenti" dell'ANPI di Atessa (CH). Scrive su Laputa e Il Medievalista. Tra un premio e l'altro lo trovate al ristorante "Il bicchiere della staffa" di Civitanova Marche. If you like our work, please support us!